'Why are atoms so small?' asks 'naive physicist' in Erwin Schrodinger's book 'What is Life? The Physical Aspect of the Living Cell'. 'The question is wrong' answers the author, 'the actual problem is why we are built of such an enormous number of these particles'. The idea that everything is built of atoms is quite an old one. It seems that l Democritus himself borrowed it from some obscure Phoenician source . The arguments for the existence of small indivisible units of matter were quite simple. 2 According to Lucretius observable matter would disappear by 'wear and tear' (the world exists for a sufficiently long, if not infinitely long time) unless there are some units which cannot be further split into parts. th However, in the middle of the 19 century any reference to the atomic structure of matter was considered among European physicists as a sign of extremely bad taste and provinciality. The hypothesis of the ancient Greeks (for Lucretius had translated Epicurean philosophy into Latin hexameters) was at that time seen as bringing nothing positive to exact science. The properties of gaseous, liquid and solid bodies, as well as the behaviour of heat and energy, were successfully described by the rapidly developing science of thermodynamics. The theoretical basis of this book is developed ab ovo. This requires dealing with several problems arising in physical chemistry including the concept of entropy as a thermodynamic coordinate and its relation to probability. Thus Maxwell Boltzmann and Gibbs statistical thermodynamics, and quantum statistics are made considerable use of. A statistical mechanical derivation of the law of mass action for gases and solids is presented, and the problems arising in the application of the law of mass action to the liquid state are addressed. 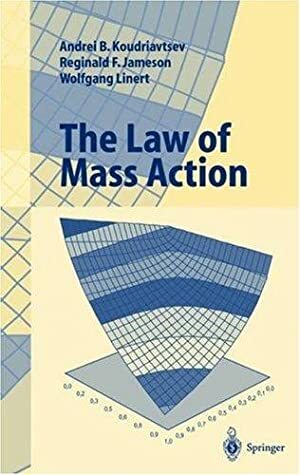 Molecular interactions and how to take them into account when deriving the law of mass action is discussed in some detail sketching a way alternativ to the use of activities. Finally, attention is drawn to the statistical mechanical background to Linear Free Energy Relationships (LFER's) and of Isokinetic Relationships (IKR's) and their connections with molecular interactions. J. Hood, Booksellers, established 1974, specializes in scholarly books in all subject areas, with large holdings in the sciences, art, philosophy, medieval & renaissance studies, the social sciences and the humanities. We currently have 43,000 volumes in stock and sell exclusively on the internet. We are members of the Antiquarian Booksellers' Association of America and the International League of Antiquarian Booksellers. request. Returns accepted within two weeks with advance notification. Unless otherwise requested - U.S. Priority mail $7.00 for the first volume and $4 for each additional volume; U.S. Media mail $4.50 for the first volume and $2.00 for each additional volume. Shipping by Priority airmail international envelopes is available to most countries for standard size books at $32 per volume. Address: Baldwin City, KS, U.S.A.